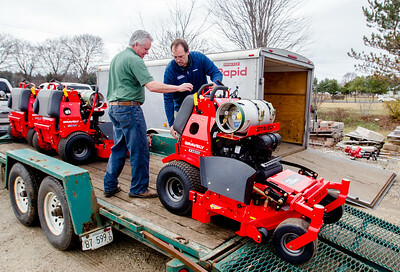 Sarah Nader- snader@shawmedia.com Phil Hagen (left), president of McHenry Garden Center, and Mike Halloran, owner of Halloran Mower Works, unload new propane mowers at McHenry Garden Center in McHenry Wednesday, March 9, 2016. The shop is now selling propane mowers as part of their effort to turn their business environmentally friendly and reduce cost in the process. 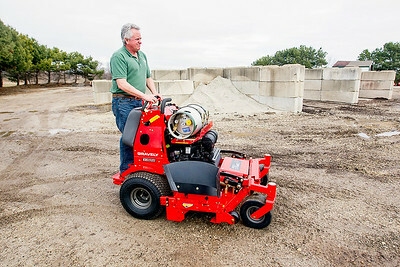 Sarah Nader- snader@shawmedia.com Phil Hagen, president of McHenry Garden Center, unloads a new propane mower at McHenry Garden Center in McHenry Wednesday, March 9, 2016. The shop is now selling propane mowers as part of their effort to turn their business environmentally friendly and reduce cost in the process. Sarah Nader- snader@shawmedia.com A view of new propane mowers at McHenry Garden Center in McHenry Wednesday, March 9, 2016. The shop is now selling propane mowers as part of their effort to turn their business environmentally friendly and reduce cost in the process. 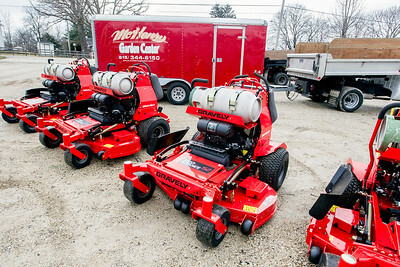 A view of new propane mowers at McHenry Garden Center in McHenry Wednesday, March 9, 2016. The shop is now selling propane mowers as part of their effort to turn their business environmentally friendly and reduce cost in the process.